CloudMagic did have a similarly priced pro tier previously. It was launched in early 2015 as an upsell with features like unlimited email accounts, preference syncing, remote account wipe, and so on. After the 14-day trial, you'll have to pay the yearly price for Newton or lose the premium features. What are the premium features? That's not explained very well. There are some new features intended to justify the price (these might be the "premium" features). Here's what's new in this version (other than the name). The user base isn't happy, but the developers had to expect that. There probably just weren't enough people subscribing to the pro version to support development. With so many great free email clients, there just might not be space for an app like Newton that costs $50 per year. 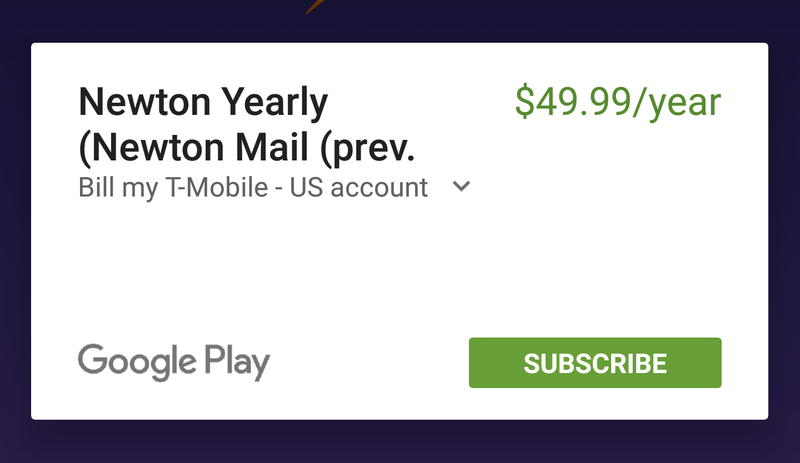 The subscription is handled via Play Store billing, so it's easy to set up if that's what you want to do.